Adept cms can clear your gutters, our Wireless camera means we can record the process giving you peace of mind that your gutters are clear of debris and blockages. Regular gutter maintenance is key to keep water free flowing away from your property thus preventing expensive remedial work. We can also clean/restore the outside of your gutters, soffits, fascia’s and cladding, this will improve the appearance of your property and thereby add value to it. If you would like to learn more please scroll down or if you are ready for a free no obligation quote click here. Properly maintained gutters will improve the flow of water and reduce damage caused by saturation. 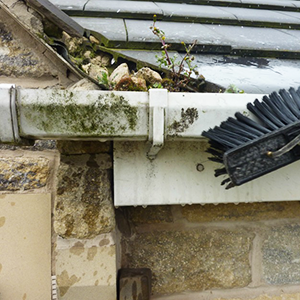 If your gutters are blocked the water may run into the cavity wall causing damp and mould which is a serious health issue – as well as being expensive to remedy. Property owners have a legal obligation to uphold the safety of all visitors (e.g. friends, the postman and even pesky salesmen) and contractors (e.g. gutter cleaner, window cleaner) visiting or working on the property. Having your gutters cleaned professionally saves you taking any risks climbing a ladder and doing the gutter cleaning work yourself. Health and Safety Risk Assessment and Method Statements will be carried out to determine the likelihood of potential risks to your property and the public with preventative measures taken. 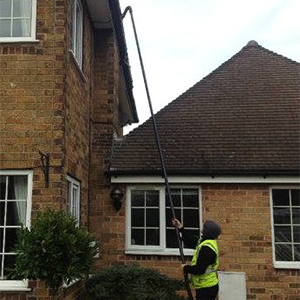 In most cases we clean from the ground with a gutter vacuum which allows the job to be done quicker, safer and cleaner. All of our staff are trained in working safely for the benefit of ourselves and our valued clients. If anyone is working at height on your property and has an accident, you may more than likely be liable as it is your responsibility to ensure they were working safely. A gutter efficiency test will be carried out to ensure rain water flows away as it should as neglected gutters full of debris can cause bowing or distortion to the guttering pipes; Incorrect installation may also be the cause of inefficient run off, thus causing water to pool. We can carry out minor repairs such as re-attaching/replacing a bracket or repositioning a length of guttering. A condition report will be provided with before and after photos giving you peace of mind that everything is working and that an excellent gutter clean has been provided. Your property will be left clean and tidy. 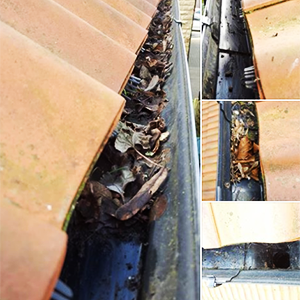 We recommended that gutters be cleaned at least once a year usually in autumn after the leaves have fallen. If your property has a lush landscape, you may consider two cleans a year, once in the autumn and then again in the spring.